I gave a talk on the Big Bang to our astronomy class at WIT last night, describing most of the above topics. It was great fun, with a lengthy question and answer session afterwards, fielded by both me and well-known astronomer Emmet Mordaunt who normally takes the class. You can find the slides for the talk here. In 1998, a totally unexpected result from astronomy caused a dramatic rethink of the Big Bang model. Measurements of the light emitted by a certain supernova suggested that it was further away than predicted by the Hubble constant. In other words, the exploding star did not lie on the straight line of the Hubble graph! This is a startling discovery as it implies that the expansion of the universe is not constant – instead the expansion is currently accelerating (see a description of the experiment here). Skeptics at first suggested the result might arise from an error in the measurement of stellar distance – however, a similar observation was reported by a different group within two years. Further, independent support for the result soon emerged from measurements of the cosmic microwave background (CMB). In 2002, precision measurements of the CMB by the WMAP satellite suggested a universe with geometry that is flat to within 1%. This result is completely inexplicable in the context of the known density of the matter of the universe (both ordinary and dark). The known density of matter points to a universe with Ω = 0.3, a long way from flatness (Ω =1). Hence the CMB measurements suggest that there is a great deal of matter/energy in the uiverse unaccounted for. As a result, cosmologists now talk about a new phenomenon; a form of energy that is pushing the universe outward, causing the expansion to accelerate and the geometry to be flat. The phenomenon is labelled Dark Energy : the physical cause for dark energy is thought to be some sort of vacuum energy. However, it should be pointed out that the numbers don’t yet stack up – detailed calculations suggests that the postulated vacuum energy would cause an accelerated expansion many orders of magnitude greater than that observed…this is a major area of research at the moment. 1. 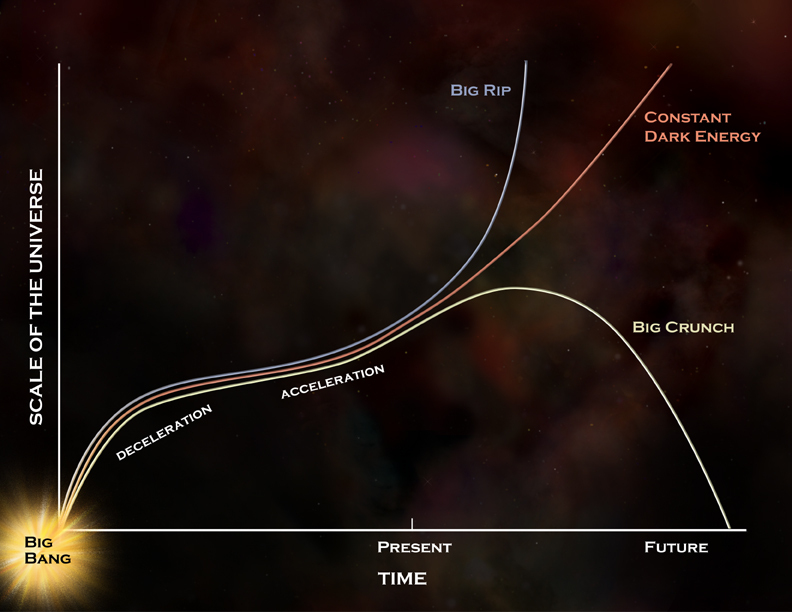 Is Dark Energy compatible with relativity? 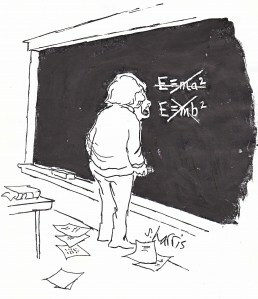 Yes, but note that an accelerating universe is not predicted by the Friedmann equation, i.e. does not feature in any of the Friedmann universes (see post on the expanding universe below). Going back to 1st principles, when one applies the equations of general relativity to the cosmos, an extra term must be added in order to account for the accelerating expansion. This is rather reminiscent of the manner in which Einstein himself , dismayed by the prediction of a dynamic universe, originally added a term to his equations in order to keep the universe static (the positive cosmological constant) . Now we apply a term to the other side of the equation for the opposite reason. 2. Is Dark Energy compatible with inflation? 1. The fact that the expansion is accelerating now makes the suggestion of an exponential expansion in the first instants a lot less fanciful. 2. While the current accleration is many orders of magnitude less than that of inflation, it may be that the cause is some energy left over from inflation – more on this later. The posts below constitute a brief introduction to the Big Bang model: the three planks of evidence, the problems of singularity, horizon and flatness, and the theory of inflation. Before we go on to discuss the Standard Model of cosmology (yes, there is such a thing), two further concepts are necessary: the old puzzle of Dark Matter and the new puzzle of Dark Energy. Dark matter is thought to make up about 70% of the matter of the universe. Although we can’t see it, we presume it exists because of its gravitational effect on visible matter. Put differently, we don’t insist that all matter be ‘visible’ i.e. interact with the electromagnetic force. Instead, we include the possibility that some matter may be seen only by its gravitational effect on other matter. DM was first postulated by Fritz Zwicky in the 1930s to account for a discrepancy between the calculated velocity of spiral galaxies and that observed. Nowadays, it has been proposed to account for the motion of many astrophysical phenomena from the smaller scales to the largest e.g. local stellar dynamics, galaxy rotation, galaxy cluster dynamics, X-ray halos, gravitational lensing and cluster streaming. A second pointer of evidence for Dark Matter comes from cosmology, in particular from the cosmic microwave background (see post below). In order to to relate the miniscule variations in temperature seen in the CMB to galaxy formation in the early universe, all current models invoke the existence of DM. Even more importantly, the existence of DM is necessary to provide enough gravity to explain the flatness of the universe, as measured from the CMB (in conjunction with the postulate of dark energy – see next week). It should be pointed out that not everyone agrees with the postulate of Dark Matter. Skeptics point to the possibility that our laws of gravity (both Newtonian and Einsteinian) may be failing at the largest scales – a theory known as modified Newtonian dynamics or MOND. However, most cosmologists now consider this possibility unlikely, due to the astrophysical and cosmological evidence above. Best of all, the first hint of direct evidence DM was reported in a study of galaxy collision in 2007. If Dark Matter really exists, one might expect to observe ‘galaxy splitting’ in the case of galaxy collision. This is because the DM of each galaxy should interact little with the other, while the ordinary matter of each will interact strongly (just as a couple crossing a crowded room soon become separated if one is more social than the other!). Researchers at the University of Arizona are pretty sure this is exactly what they observed (see here). A similar result was reported by NASA in September 2008. What could Dark Matter be made up of? Clearly, DM particles must be weakly interacting (otherwise we would see them) and possibly massive – i.e. weakly interacting massive particles or WIMPs. It is currently thought that the most likely candidates might be supersymmetric particles. (As we saw before, the theory of supersymmetry (SUSY) arises out of attempts to unify three of the fundamental forces – the theory postulates that every normal particle has a heavier supersymmetric partner). It turns out the most likely candidiate for DM is the neutralino, the lightest SUSY particle which cannot decay further. Many groups around the world have been constructing experiments to look for particles that might be candidates for Dark Matter – you can find a post on a lecture on this subject by Tim Sumner of the Zeplin III experiment here and there is a very good overview of the Zeplin experiment itself here . However, this is straying into the area of particle physics; for cosmologists, establishing the existence of DM unequivocally is the real challenge. The theory of inflation (below) offers a very neat explanation for the homogeneity and flatness of our universe, i.e. offers a very neat solution to the horizon and flatness problems of the Big Bang model. But what physical mechanism could have caused inflation? What could cause the infant universe to undergo a psychotic, exponential expansion in the first fractions of an instant? The basic idea is that the infant universe may have undergone a phase transition. In particle physics, it has long been predicted that the quarks in the quark-gluon plasma must have undergone a phase transition to become trapped in hadrons in the first billionth of a second. Cosmologists now believe that, even earlier in the history of the universe, the fundamental constituents of matter/energy may have undergone a phase transition at even higher energies. Under certain circumstances, such a phase transition would be accompanied by the appearance of energy in empty space (so-called vacuum energy). Calculations show that this vacuum energy could act as an enormous force of repulsion, causing a rapid, exponential expansion of spacetime. Technically speaking, it is thought that the very early universe cooled into a metastable state of false vacuum – it was then nudged towards genuine equilibrium by a process of quantum tunnelling. However, it was soon shown that the latter process is too violent to result in the universe we observe today. 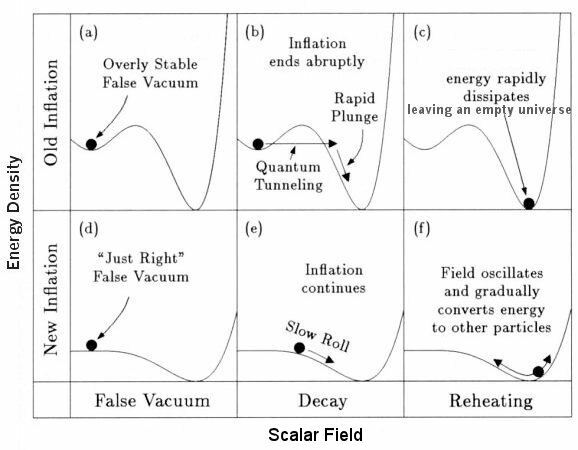 Instead, Linde , Albrecht and Steinhardt calculated that a more realistic model is a universe that moves from false vacuum to equilibrium via a gradual process as shown below. Finally, it was assumed in all the early versions of inflation theory that the vacuum energy liberated by the phase transition disappeared immediately after the hyper-expansion. However, it has recently been discovered that the rate of expansion of the universe is currently accelerating! This observation was a great surprise as it is not predicted by any of the Friedmann models; it is now believed that the cause of the acceleration (known as dark energy) may be a small amount of vacuum energy left over from inflation….more on this next week. 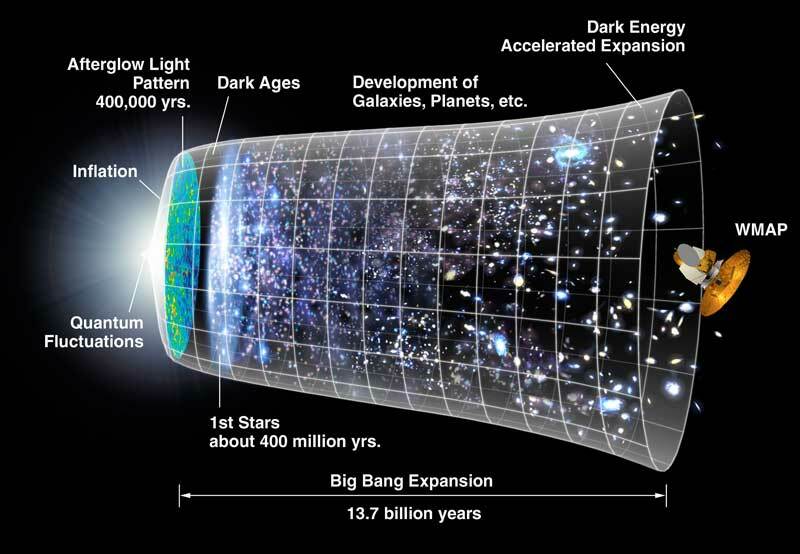 We have discussed the three main planks of evidence for the Big Bang model: the Hubble expansion graph (and consequent estimate of the age of the universe), the abundance of hydrogen and helium, and the cosmic background radiation. These leave little room for doubt that the basic model is correct. On the other hand, close examination of the model raises many questions – in particular the singularity, horizon and flatness problems (see posts below). Another problem is that it is not clear from the model how perturbations in the early universe led to the large scale structure of galaxies and galaxy clusters seen today. A possible solution to these puzzles is the theory of inflation. First proposed by Alan Guth in 1981, inflation posits that in the very first fractions of an instant after the Bang, the young universe underwent an exponentially fast expansion (faster than the speed of light) – totally unike the Hubble expansion we see today. This does not violate principles of relativity, since relativity sets no constraints on the behaviour of spacetime itself. An inflationary expansion of the very early universe offers a simple solution to the horizon problem: if the universe expanded arbitrarily fast, even the farthest flung points could once have been in thermal contact. In other words, the properties of distant points in the universe would not be determined by a competition between the finite speed of light and the finite age of the universe, as previously thought. Inflation also offers a neat solution to the flatness problem: it was soon shown that, instead of deviations from flatness quickly leading to a runaway open or closed universe, deviations in an inflationary universe tend to be driven back towards flatness. The geometrical equivalent of this is to imagine a balloon being inflated to enormously large dimensions – of course the surface is driven towards flatness. This is a simplified overview of the theory of inflation – the main point is that inflation offers a version of the Big Bang model in which the universe is driven towards the critical value of flatness/ mass density that exists today, far from accepting it as lucky coincidence. What is most impressive about the theory is that, contrary to public perception, inflation was not originaly posited in order to address problems in Big Bang cosmology. In fact, the theory arose in an attempt to address certain puzzles in Grand Unified Theory (the branch of particle physics that seeks to unify the strong interaction with the electro-weak interaction). Guth’s proposal was at first treated with incredulity by the cosmological community – however, it was quickly realised that it offered an intriguing solution to the problems above. 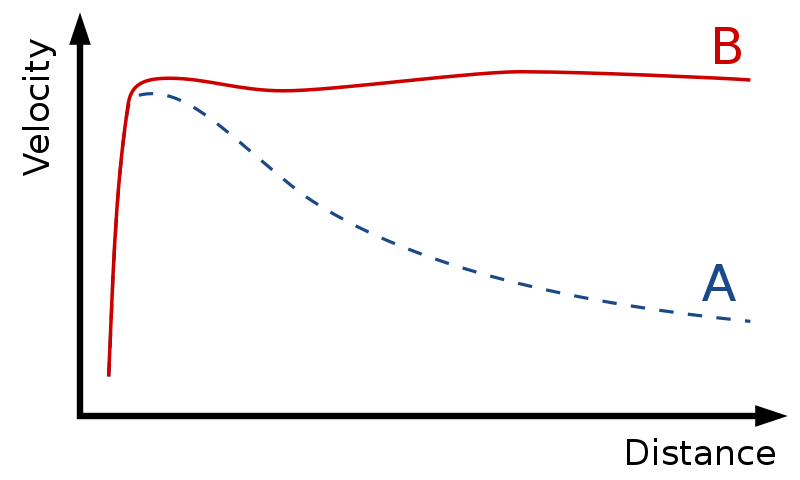 As so often, the original model of inflation was found to contain a fatal mathematical flaw (the end of inflation was incompatible with the known universe). This flaw was soon overcome in a modified version of inflation by Linde and Steinhardt. Nowadays, many versions of inflationary models have been posited: which particular version is correct remains to be seen, but strong theoretical and experimental support for an inflationary universe has been forthcoming (more on this next day). Another question concerning the Big Bang model concerns the geometry of the universe and has become known as the Flatness Problem. Recall that a key prediction of general relativity is that matter distorts spacetime – i.e. the force of gravity is essentially a distortion of spacetime by mass. Hence the curvature of the spacetime of our universe will be determined by the density of matter in it. Assuming only that the universe is homogenous and isotropic, it can be shown from general relativity that three distinct types of universe are possible (first calculated by Alexander Friedmann). If the universe has a high enough density of matter, gravity will triumph over the energy of expansion as time goes on and space will be pulled in on itself, much like a sphere (closed universe). On the other hand, if the universe has a low enough density of matter, gravity eventually loses the battle with the energy of expansion and space will curve outwards (open universe). A third but unlikely possibility is that the curvature of space caused by matter could be exactly balanced by the energy of expansion – in this case space would not be curved but have Euclidean geometry (flat universe). We say the above mathematically by defining a flatness parameter Ω to be the ratio of the actual density of matter d to the critical density dc required for flatness i.e. Ω = d/dc . Hence we characterize an open,closed or flat universe as Ω < 1, Ω >1 and Ω = 1 respectively. This mystery has come back to the fore in recent years: measurements of the cosmic microwave background are strongly indicative of a universe that is exactly flat (at least to 1%) at the time of recombination. So now we also have experimental evidence of an exact balance between the density of matter in the universe and the energy of expansion. Again, why such a precise balancing act?